Your suiting tips practically scream “go do this”, to anyone who has a fursuit and is tempted to try public suiting but hasn’t yet dared. You give an impressive list of your local Texas-based places to try it, from shows to festivals to random neighborhood exploring. You even rate them from best to worst. It shows a lot of dedication! How often do you go? Can you say more about starting- was it just doing cons with others, making plans, or did the character naturally lead you out on your own? We’re lucky enough to live in a city that’s weird and welcoming to street art and performance. Some places are well suited for random, public appearances, and some are very much not. I have very little fear of walking down the sidewalk in fursuit in Austin Texas, but I would never try it in Tomball Texas. Many people, though, might live in driving distance of a lively college town or artsy area that will have an event they could attend in fursuit. That aside, don’t be afraid! If you’re comfortable and genuine, the public will love you. Coast to coast, I’ve found people to be delighted and entertained by seeing us march around in silly costumes. Tons of people will stop and ask for a picture. I’ve seen so many passersby catch sight of us and continue along their way with a huge smile on their face. Children point and laugh. Adults run up for hugs and ask tons of questions. A typical day becomes unexpectedly, adorably amusing. I travel a lot for work, and brought my fursuit on a work trip one spring. I had the fortune of quickly meeting some very kind, fun people, and was able to costume in a public park. That first experience was terrifying and exhilarating, and couldn’t have been more magical and successful. After that, I started seeking and trying new events that might work well for renegade fursuiters. We’re out in suit every weekend during some months. Hot Texas summer months and rainy months are a little slower. Did you ever see yourself as a natural street performer, or have anything to do with it when you were a kid? Or did you grow into it by surprise? As a kid, I was pretty terrified by mascots. I never expected that I’d be one! It’s true, suits ARE expenses not everyone can afford, but if that’s in reach, anyone can transform into an immersive character. It’s a great way to escape known roles. It’s understandable to keep reservations though. If your suit is so special you wouldn’t beat it up with street grime, that’s a good reason not to take it to the street. Having traumatic experiences can make you stick to safer places. It can take particular outgoingness. But I think the payoff is a mountain of hugs, photos, and smiles. Do you have any thoughts about rewards you’ve found from it, or how it changes people? We’re plagued with a million stresses and concerns in life. Timelines, appointments, meetings, projects, goals, bills, problems, obligations… When I’m in a costume, interacting with the public, all of those things disappear for a wonderful moment in time. This is the same joy shared by anyone in a fully engrossing activity. Athletes, artists, musicians, gamers, spiritualists.. we find peace in things that steal us away from our worries for a bit. 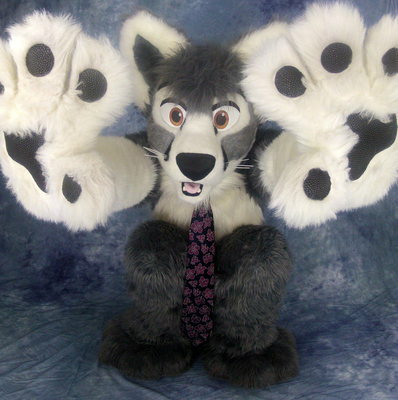 Public fursuiting is somewhat disruptive and unquestionably attention-grabbing. I don’t perform in public for exclusively altruistic purposes, but we never ask for money, we respect people’s physical space, and we don’t do uncouth behavior. Surely there are some who find our activities to be a nuisance. My opinion differs from theirs, and that’s okay. Public fursuiting puts yourself and your costume at a higher level of risk to be certain. It’s more risky than a convention, or wearing it in your bedroom.. but the reward is two-fold for me. First, sharing the wonderful creation of the suit-builder and your own outgoing personality and performance with those who haven’t seen such a thing before. People walk away with an unexpected smile, a memory, and maybe a discovery for themselves. And, I’m exhilarated as well. Mercury and I have shared things that I never could have imagined. 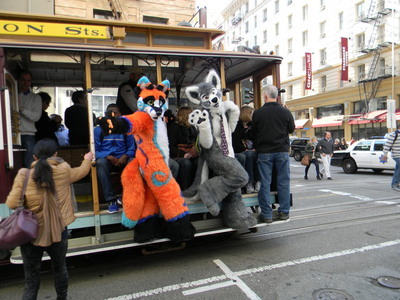 We’ve costumed in the biggest, most dense areas in the U.S… taken Manhattan subways and San Francisco cablecars in fursuit… and luckily never had a traumatic experience to speak of. There’s risk, but it’s only done with understanding, planning, and care. More soon in part 3.